There are two species of trees commonly called redbud trees: the Eastern redbud (Cercis canadensis) and the Chinese redbud (Cercis chinensis). Each of these species has many cultivars, or types. The Eastern redbud is native to the United States and is generally much larger than the Chinese redbud. Both trees and their cultivars are hardy, popular ornamental trees, according to Clemson University. "Forest Pansy" is a popular cultivar of the Eastern redbud, but it is hard to find, according to Ohio State University. This type of redbud, which can grow to a maximum height of 30 feet, has pinkish-purple flowers in the spring followed by rich, dark burgundy leaves in the summer. In hot climates, the summer sun may fade the color of the leaves, turning them dark green. Interestingly, "Alba" is the name for both a cultivar of Eastern and Chinese redbud trees. The "Alba" cultivar of both species features small, white flowers rather than the typical pink or purple buds. The flowers bloom in mid-to-late spring, which is a bit later than many other cultivars. "Royal White" (C. canadensis) is a popular alternative to "Alba" that is cold-hardy and blooms earlier in the spring. Both "Royal White" and "Alba" can reach an average maximum height of 25 feet. While most redbuds are rightly desirable for their profusion of purple flowers, "Silver Cloud" is popular for its variegated leaves, which are green splashed with blotches of creamy white or silver. The flowers are pink. The leaves are more fragile than other cultivars and can be scorched by the direct sun. For that reason, "Silver Cloud" is best grown in partial shade, according to North Carolina State University. It can reach a maximum height of 30 feet. "Convey" is a distinctive cultivar of C. canadensis. It is one of the smallest types of redbuds at a maximum height of only 5 feet, but the truly unusual thing about this cultivar is its twisting, weeping branches. "Convey" has purple-pink flowers. "Avondale" is a very prolific blooming C. chinensis cultivar. 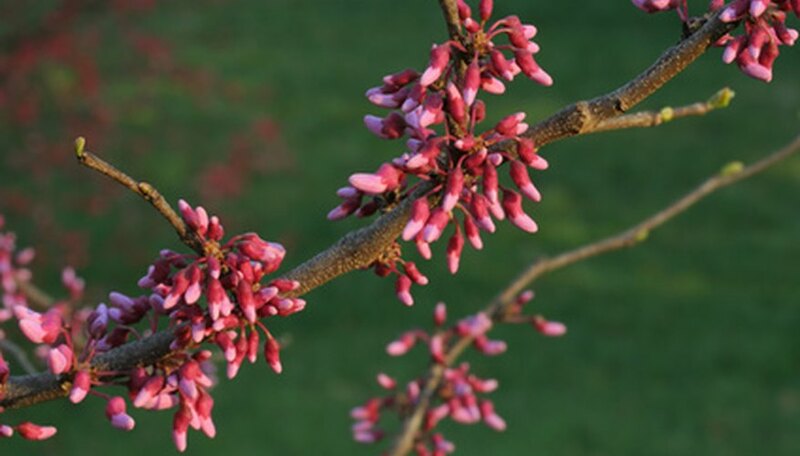 More like a small shrub than a tree in form, this type of redbud is desirable for the fact that every inch of every branch is covered with small, bright-purple blooms in the spring, long before the leaves emerge. "Avondale" is another smaller redbud variety, growing to a maximum height of 12 feet and a maximum width of 10 feet. How Fast Do Walnut Trees Grow? What Trees Flower in Early Spring?